Art assets are coming along well for Tempest: Shards of the Gods. Indeed, the Egyptian cards are 100% commissioned and 88% completed! 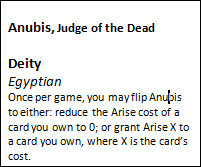 Work has also begun on the first of our Deity cards: Anubis, Judge of the Dead. The earliest iteration of Anubis. With all of that, it seemed like a great time to explain a bit about how Deity cards work in Tempest. Deity cards have been a part of Tempest from the very beginning. They are a physical representation of the player on the battlefield, sort of like Plainswalker cards in Magic: The Gathering or the Phoenixborn cards in Ashes: Rise of the Phoenixborn. In the world of Tempest, they are all that survived the sundering of the universe, and they work to piece together a domain for themselves out of the Shards that remain. Not all of them agree on the best way to do that though, and that is where they come into conflict. When two Deities clash, they send warriors, heroes, priests and monsters from a Shard they control into a Shard controlled by another. The victor claims the spoils and the defeated Deity is cast down. 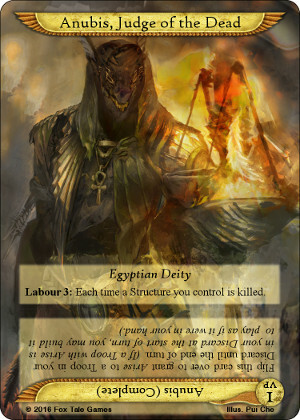 Each Deity comes packaged with a number of other cards (similar to a Shard card). In that way, players begin the game with prebuilt decks that are themed around the myths and legends of a particular Ancient God. There are four deities in the Tempest base game. 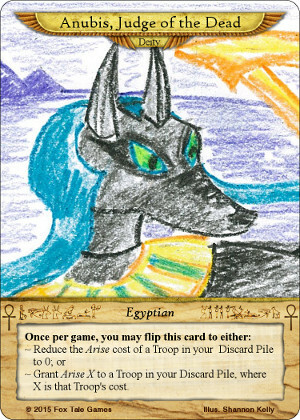 Anubis leads the Egyptians, allowing players to Arise their Troops from the Discard pile and bring them back from the dead. Inari leads the Japanese, bringing fox messenger ‘kitsune’ into battle, using the Shapeshift ability to trick opponents and adapt his/her Troops to suit the situation at hand. Athena leads the Greeks, bringing mighty heroes like Jason and Odysseus, and prophecies that help them on their journeys. And Heimdallr leads the Norse, blowing the Gjallarhorn to mighty valkyries and spirits of the slain to battle in Ragnarok, and using the unmake mechanic to erase opponents’ Troops from the game. Deities have always had a once-per-game ability that granted a brief spike in power to their forces. This ability has evolved for some over time. For Anubis, his ability to grant Arise to one of his cards was so thematic that it remained in all of his forms. In response to playtester feedback, a number of aspects of Tempest have been simplified. A late change in Tempest‘s development was a renewed focus on “victory points” scoring abilities. The game is so much more than combat, as players can also win by telling stories with their cards. Unfortunately, most players on an initial playthrough were hesitant to embrace that aspect of the game. A number of changes have been made to make that a more attractive prospect. Tales have been separated out of the Research deck, so that players no longer have to purchase their goals. Instead Tales are randomly dealt to each player at the beginning of the game, giving a straightforward goal from the get go. A second change was to give Deity cards a way to score victory points. So far, this has been quite a positive change, as players are immediately introduced to a simple way to score points, and by following that Labour ability are also pointed towards how that Deity’s faction plays the game. Over time, the Deity cards were further simplified, removing one of their flip abilities. Previously, one of the flip abilities benefited the faction as a whole, while the other benefited only the cards packaged with the Deity. A lot of feedback suggested that this choice was unnecessary, and so two became one. 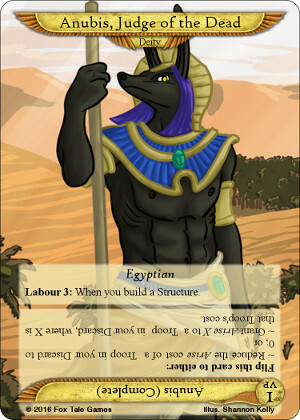 The latest version of Anubis features a modified Labour ability that points to the Egyptian proclivity for building Structures, but also Anubis’ judgment over all things dying. The single flip ability benefits the entire faction, and allows for many interesting interactions with other Egyptian cards. The art for the card that you see is an in-progress version from Pui Che, featuring Anubis weighing a soul against the Feather of Ma’at (truth). Pui is working on making our four Deity cards as magnificent and powerful as possible. Keep an eye on our Instagram for when that final piece comes in! We can’t wait! As for the card layout, that is also a work in progress: making the words as visible as possible while trying to show off all of that amazing artwork. The card still has a little way to go, but we are getting there! If you are interested in keeping up to date with everything Tempest (as well as our other side projects), you can join our mailing list by putting in your details above or by emailing info@foxtalegames.com.